I promised to continue my travelogue, in which our adventures resumed in torrential rain. 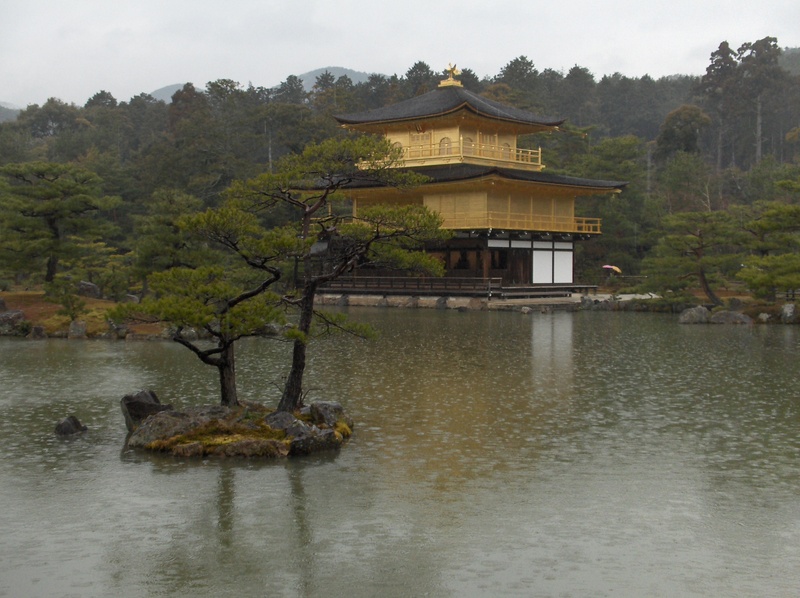 We were thoroughly soaked by the time we reached Kinkakuji (金閣寺), which became a Zen temple in 1408. We trudged on through the wet grounds and paused at a stand to select a charm as a gift. When we did, the woman behind the table brightly smiled at my younger son, who (it being T-shirt weather, dagnabbit) was soaked to the skin from the pouring rain. She held up a sign for him: “300 yen.” She then pointed to a clear umbrella. So it was a round of umbrellas for us less-prepared travelers. We continued on towards a place a friend of my daughter’s had told her we should be sure to visit. 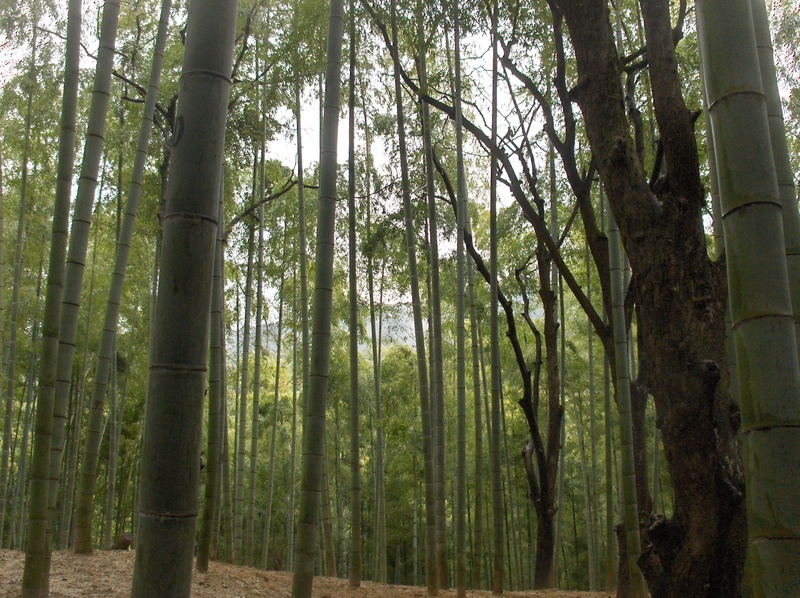 It was a wonder: Fushimi Inari Taishi (伏見稲荷大社), a Shinto shrine with trails into the forest on Mount Inari. Inari is the Shinto god of rice and sake, to whom the Temple was dedicated in the eighth century. Foxes, standing guard at many of the torii shrines, are said to be Inari’s messengers. 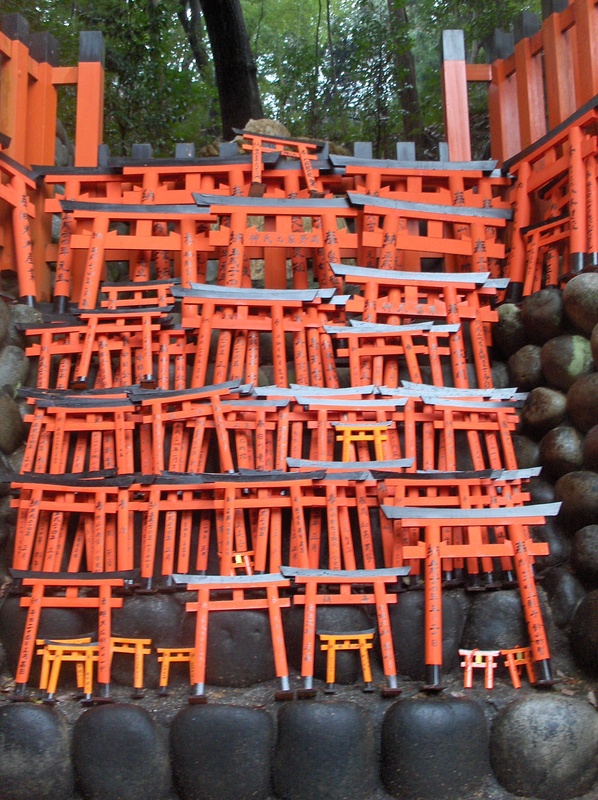 It is sometimes known as the Shrine of a Thousand Torii Gates, but has thousands upon thousands of bright orange, pi-shaped gates tipped with black. I did not know at the time that the literal meaning of a torii gate is “where the birds rest”; my husband Jim was a devoted caretaker of birds, and I frequently see them as among my messengers from him. These gates are arranged into paths. Others are set one inside the other, in descending sizes, like an endlessly self-referential Escher sketch (or Stephen Colbert’s portrait). We wandered through the paths of Pi for hours, climbing high on Mount Inari to look down upon a city that remained shrouded with rainclouds. It is more common today to wish for business success than to weigh in for rice and sake at this incredible place, but we were told that one can wish for anything by way of those vermilion gates. I used my silver yen to purchase a miniature gate for each of my children, on which I will inscribe my infinite wishes for them. 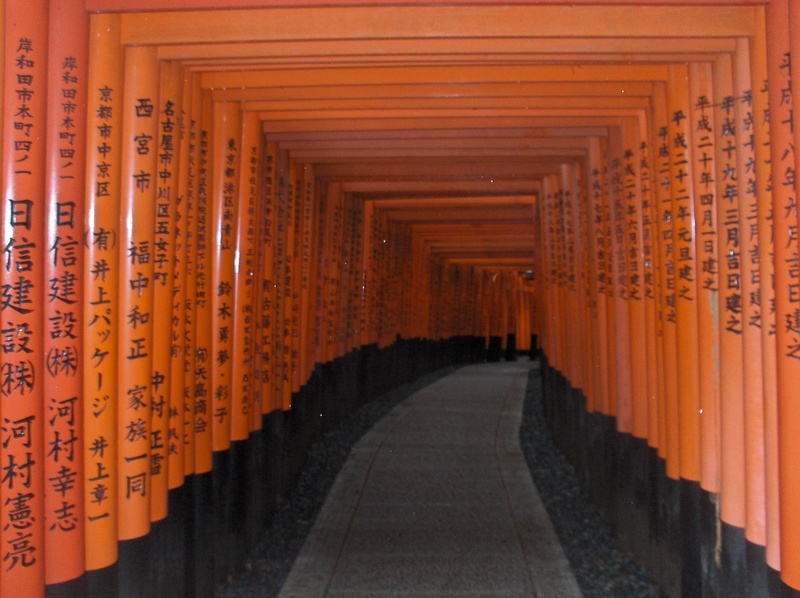 This entry was posted in Metaphorical Mathematics and tagged Escher, foxs, Golden Temple, Inari Taishi, Kinkakuji, Kyoto, Mount Inari, rice, sake, Shinto, shrine, Stephen Colbert, torii gate, travelogue, Zen. Bookmark the permalink.